Washington – Rules under consideration that would make it easier for Indian tribes to win federal recognition have a carve-out aimed at denying that status to several Connecticut tribes, but Sen. Richard Blumenthal has joined others in saying the provision may be unconstitutional. Blumenthal and Connecticut’s tribes have been on opposite sides when it comes to the BIA’s decision to change rules for federal recognition. Recognition would allow the tribes to establish casinos, press land claims and have autonomy from the state on their reservations. The proposed rule would allow the Eastern Pequot Tribal Nation of North Stonington, the Golden Hill Paugussett Nation of Bridgeport and the Schaghticoke Tribal Nation of Kent, which are not federally recognized, to reapply for recognition, but it would subject their applications to the approval of those who have previously opposed their bids. The Connecticut tribes, and many other Indians, hope the BIA eliminates the “third-party veto” provision, which they say is unconstitutional. Opponents include state and local officials and some business interests. They are concerned federal recognition of additional tribes will result in new casinos, extensive land claims and the end of a revenue-sharing agreement with Connecticut’s two federally recognized tribes, the Mashantucket Pequot Tribal Nation and the Mohegan Tribe, that run big gaming operations in the state. During a trip to Washington last month, Connecticut Gov. Dannel P. Malloy told Vice President Joe Biden he would prefer the BIA not promulgate new rules. “We believe additional regulations would adversely impact Connecticut,” said Malloy spokesman Devon Puglia. But Indian tribes — in Connecticut and across the nation — are hopefully awaiting new rules. Kevin Washburn, assistant secretary for Indian affairs and a member of Oklahoma’s Chicasaw Nation, has made reform of what he calls a “broken” recognition process a priority. Washburn added the “third-party veto” to a draft of his proposed regulations last year after an initial proposal that would have paved the way for the recognition of the Eastern Pequots, Golden Hill Paugussetts and Schaghticokes came under attack from Connecticut politicians. Washburn’s latest proposal has drawn more than 350 public comments — and about 2,000 form letters supporting those comments. A majority of those comments backed Washburn’s efforts, but many criticized the third-party veto. Influential Indian groups, including the National Congress of American Indians, lobbied Washburn to scrap it. Now the wait is for the final rules to be issued. BIA spokeswoman Nedra Darling declined to say when that might be. The interim rule was made public nearly a year ago, last May, and the first draft of the plan was released in 2013. “They are still in progress,” Darling said of the regulations. Richard Velky, chief of the Schaghticoke Tribal Nation, isn’t worried that the BIA seems to be slow-walking the final regulations. He thinks the BIA will drop the third party-veto provision and is taking its time so the final rules will withstand any attack. “They want to make a decision that won’t be hammered in court,” Velky said. Washburn’s new regulations, if they are finalized, would add to the more than 560 federally recognized tribes in the nation, by easing some of the obstacles tribes have faced in proving they deserve the status. Current federal tribal recognition rules require a tribe to prove its continuous community and political authority since first contact with European settlers. Washburn’s proposal would change that to allow a petitioning tribe to demonstrate it has maintained a state reservation since 1934. To petition successfully for federal acknowledgment, at least 80 percent of a group’s membership would have to descend from a tribe that existed in historical times. Washburn’s proposal would ease that requirement. Although Washburn has been under heavy fire from Connecticut officials to abandon his plans, Bridgeport Mayor Bill Finch is a booster of efforts to change the rules. “Unlike many Connecticut leaders, the city of Bridgeport and I are long-standing supporters of social justice and have wholeheartedly supported the recognition process for all of our Connecticut tribes,” Finch wrote in his comments about the regulations. 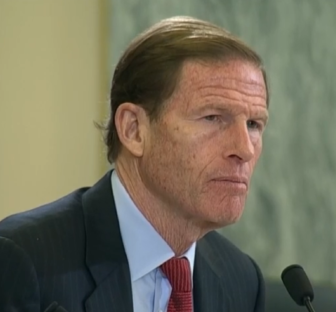 Blumenthal said he’s sympathetic to tribes who say the process is too cumbersome. He says he’d support efforts to cut red tape and deploy more BIA employees to process tribal requests for recognition, but “repeatedly, emphatically and passionately” told the agency there’s no need to change the standards for recognition. “The mystery here is why the BIA has even considered changing them,” he said.